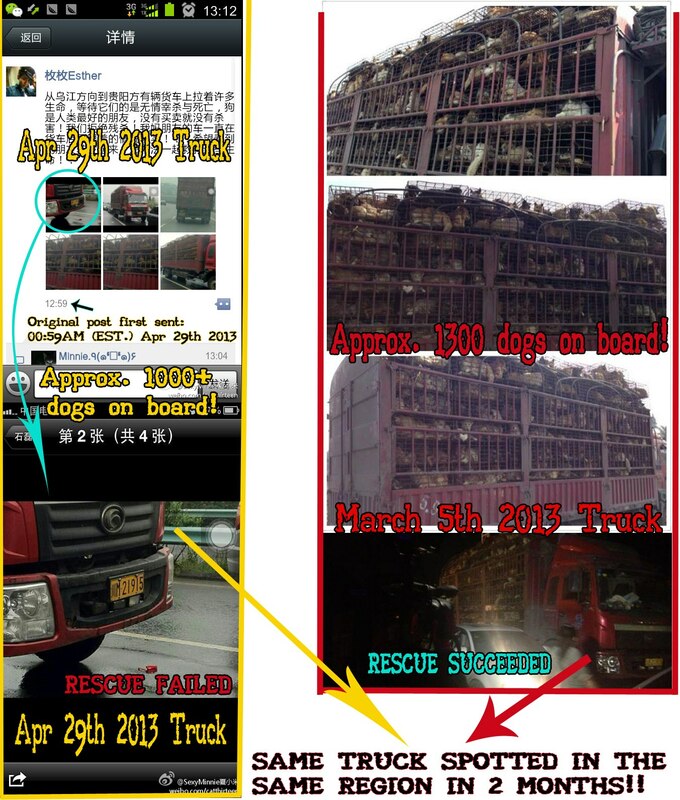 Another outrageous discovery about this dog smuggling truck is that it is the very same truck and driver from the March 5th Guiyang Dog Rescue! According to the law, before any animals can be transported for human consumption, they must be deemed healthy, quarantined, and a Health and Inspection Certificate must be issued by the local Animal Inspection Department. In the case of dogs, a certificate must be issued for EACH dog. Any unhealthy animals or those that have died from an illness or unknown reasons are not allowed to be transported, slaughtered or sold for human consumption. All of the dog smuggling trucks contain dogs in dire health conditions, many of which are actually infected with highly contagious diseases such as Distemper and Parvovirus. Unfortunately, an Animal Health and Inspection Certificate can be easily purchased through illegal channels without any kind of inspection having been first conducted by the responsible officials. This certificate indicates the number, breed, and health condition of the animals, as well as the purpose for which the animals are being transported. Due to the intense levels of corruption in China, smugglers are even able to obtain blank forms with official seals and signatures already in place! After all that they suffer along the dark, rotten chain of events that is the dog meat trade, these poor dogs end up carrying a multitude of diseases and toxins before they reach the end of their tragic journey. They are by no means safe for human consumption. The dark and rotten dog meat black market is NOT legal in any way in China, even without any animal protection laws in place. It is the severely corrupt government authorities who shamelessly allow these crimes to continue and grow! All of the crimes committed during this trade of shame are often ignored by the authorities. The people and groups who try to stop the crimes are often discredited and oppressed by the authorities. It is scary and sometimes hopeless to just think about how dark and deep this hole actually is. The infamous dog meat trade brings out the absolutely ugliest and darkest side of humanity – greed, brutality and betrayal. The activists in China are fighting an incredibly difficult battle in an environment where literally everything is against them. While it may seem like we are fighting a losing battle, we cannot ever lose heart. We will NOT lose this war as long as we keep up the fight and remain standing up for what’s right! No matter the odds, we can never allow ourselves to believe that good will not overcome evil. I know you must be very angry, and you should be. I understand that many of you more than likely have a very low opinion of China and Chinese people as a result of what you see and read here. 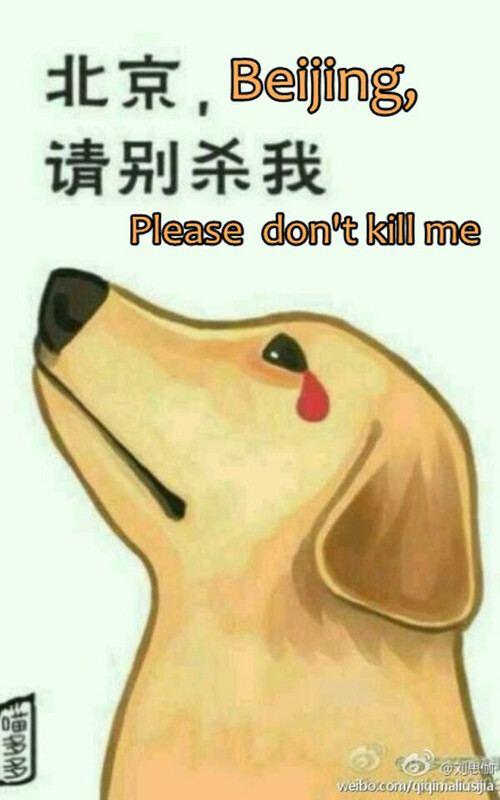 I can sincerely empathize with all of these feelings, but I challenge you open your hearts to those Chinese people who are willing to stand up against the evil, corruption, and violence that is the sickness in their world. I ask that you replace any negativity in your mind with a respect and admiration for the brave and lonely people who are sacrificing more than most of us can imagine to fight for what is right. Stand with them here and join your voice with their actions to help build the future that we all dream of. We need your support, now, more than ever before.